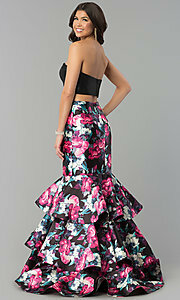 Unfortunately, the dress you are looking for (Style: BL-PG3175, Name: BL-PG3175) is no longer available. If you're looking for a two-piece prom dress to show your passion for fashion, this two-piece long mermaid dress by Blush is a one-of-a-kind style sold exclusively at PromGirl. 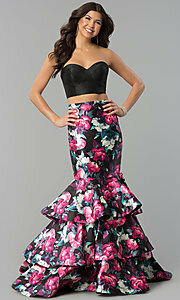 Featuring a strapless bustier crop top in gleaming black satin, this two-piece formal dress has a ruffled tiered mermaid skirt that features a multi-colored print of blooming florals over a black background. This long formal dress is selfie-ready for prom, quinceanera or sweet-sixteen party. Priced under $200, this two-piece prom dress is super cute for prom 2019.